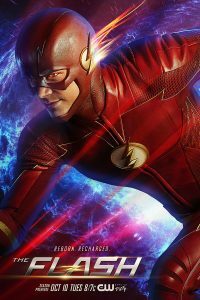 “Barry is not exactly the same as when we last saw him, and he’s going to go on a bit of a journey in the premiere episode,” Kreisberg promised about the season opener which airs on October 10 (photos can be found here). “But the most important thing about Barry this year is that the experience of being in the Speed Force was a bit of a baptism for him. The premiere episode is called ‘The Flash Reborn’ and Barry, in a way, has been born again. His experience in there has really washed away a lot of his sins, cleansed him of his doubts, fears, and his guilts, and he really loves being The Flash again. It really is leaving him free and clear to have an open road and a fresh start, and he’s just not upset the way he’s been these past two seasons,” the producer said. 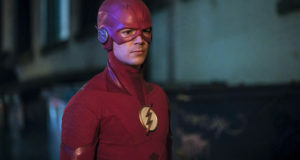 “Grant is so funny this season,” Kreisberg said about The Flash leading man Grant Gustin. 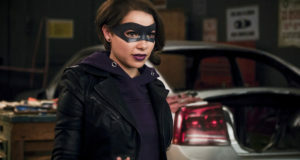 “We’ve been having him do the funniest things, and Candice [Patton] is really — making her the team leader, which unfortunately didn’t occur to us until this season, has really given her the agency on the show that she hasn’t always had. She’s always been smart, and funny, and proud, and brave, and eager, but she didn’t always have the authority that she has this season. It’s really nice to see her making decisions, and telling people where to go, and what to do, and Candice has really risen to the challenge, as we knew that she would,” he said. Kreisberg added that Barry is so happy to be back, and to be The Flash, and to be with Iris. 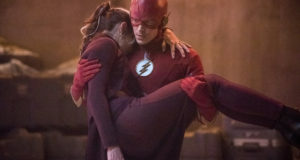 “There are some things that she experienced in the last six months, because from his perspective, he went into the Speed Force and then he was out, so for him no time has passed at all, but she had to spend six months living without him, and as she says, living with having to explain that he disappeared, it’s been a hard six months for her. So obviously she’s happy he’s back, but they do have some things to talk about,” Kreisberg teased. You can read the entire Entertainment Weekly interview with Andrew Kreisberg here.